Strone Point at Inveraray on the A83 Tarbet to Campbeltown road has been the site of a number of fatal and serious crashes over the years. Now a major project has been completed to make the road safer and aerial footage of the work by Loch Fyne has been released. 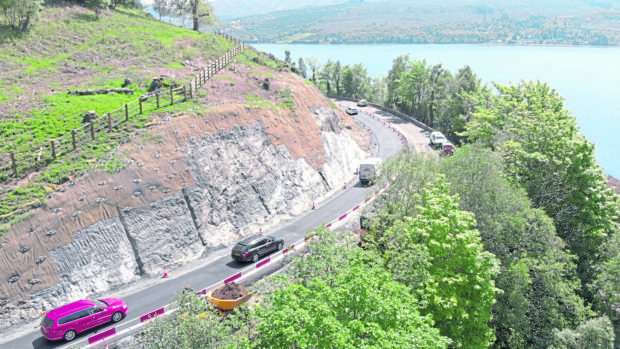 Part of carriageway was realigned and a section of the hillside scaled back, widening the road and improving driver visibility. Drainage systems have been upgraded to improve resilience in wet conditions, and new safety barriers and bike guards have also been installed. Transport, infrastructure and connectivity minister Michael Matheson said: “The section of the A83 at Strone Point on Loch Fyne is single carriageway with a history of fatal and serious accidents. This project has made it safer by opening up the width of the road and improving driver visibility around the tight bend. “The work has also allowed us to install new safety barriers and improve drainage, signage and road markings at the same time. “More than 6000 tonnes of material has been removed from the nearby slope and specialist mesh and matting installed. This will improve the slope’s stability and help to prevent debris falling onto the carriageway. Another trouble spot on the A83 not far from Strone Point is the Rest and Be Thankful, which is prone to landslides. It is the highest point on the road, separating Glen Kinglas from Glen Croe, and one of the places in Scotland with the highest risk of landslides. The hazard has increased in recent years due to the frequency of heavy, intense and prolonged periods of rainfall. Landslides have closed the road on many occasions and Transport Scotland carried out a series of mitigation works including installing netting on the hillside to catch debris and improving and re-opening the Old Military Road at the bottom of the hill as a diversion route.